Another smoothie post. Are you kidding me? Let me explain. I was looking at my WordPress dashboard this morning and noticed I’ve written 160 posts. That doesn’t seem like much for a blog turning 5 years old in a few weeks, but it does mean I’m going to start repeating myself at some point. 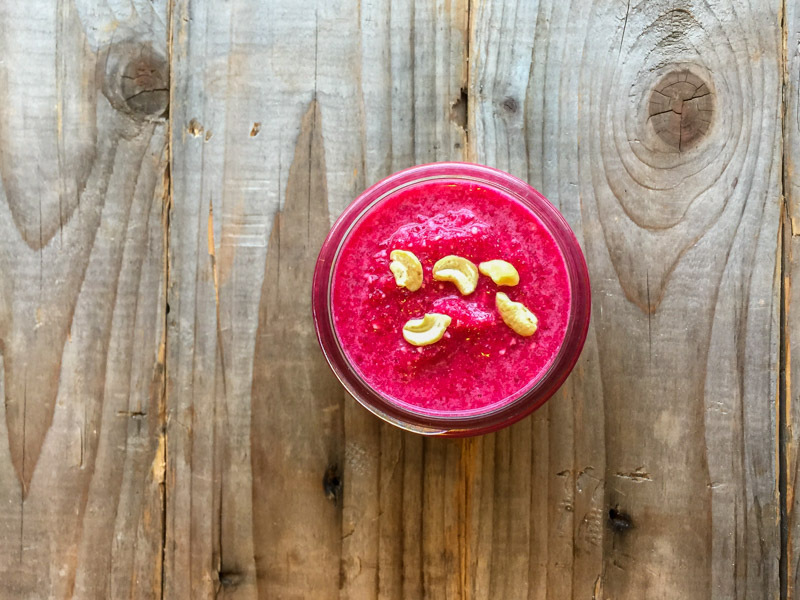 I’ve definitely written about smoothies before, and smoothie delivery companies, and dinner kit services, but this post is a slightly new take on all three. 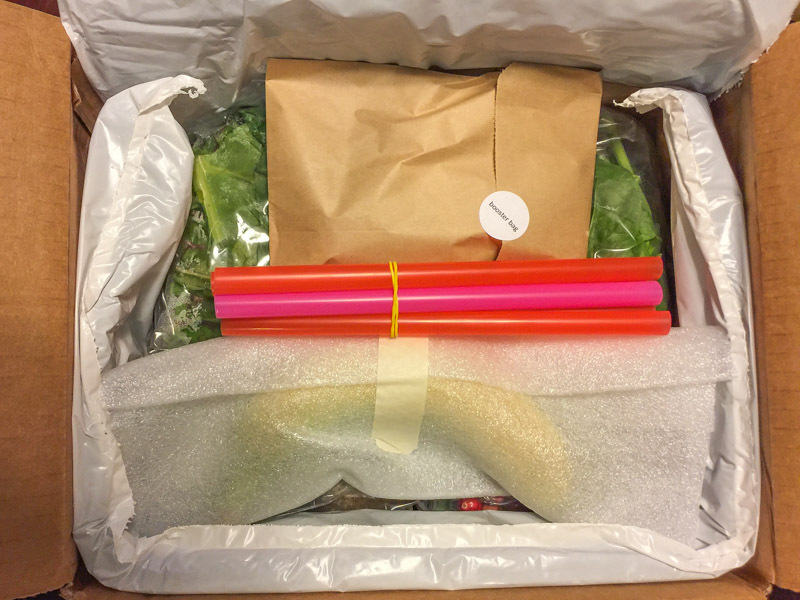 Green Blender sends you a box full of fresh ingredients, just like the dinner kit services, only it’s for breakfast this time. 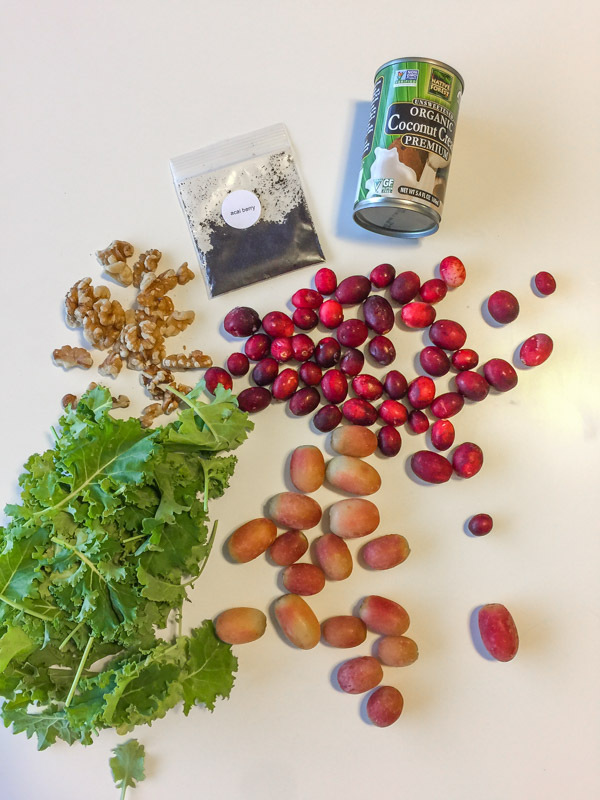 You do a tiny bit of prep, blend it all up, and start sipping fruits and veggies in no time. I signed up for two weeks, as one week doesn’t seem like a long enough test period to fully evaluate the product. 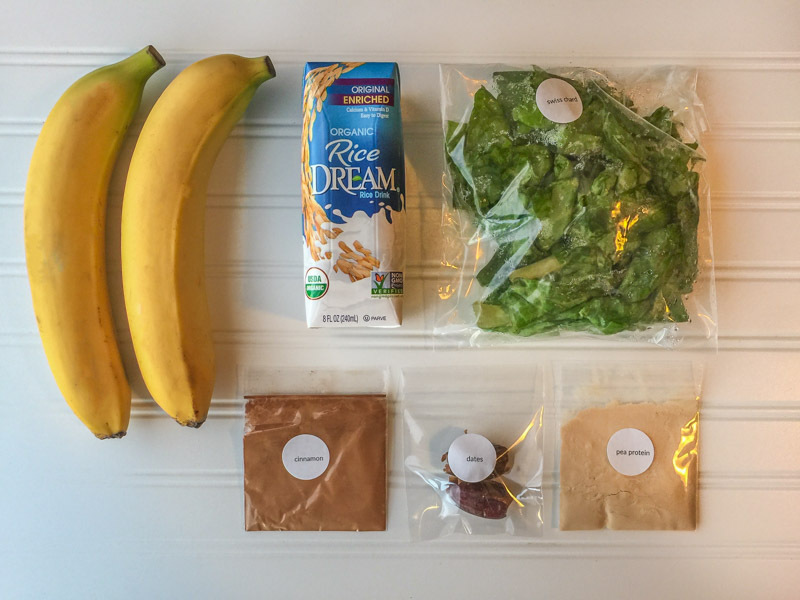 I did the Fresh Start week-to-week subscription which is $49 for 5 smoothies. That turns out to be $9.80 per smoothie which is awfully pricey. 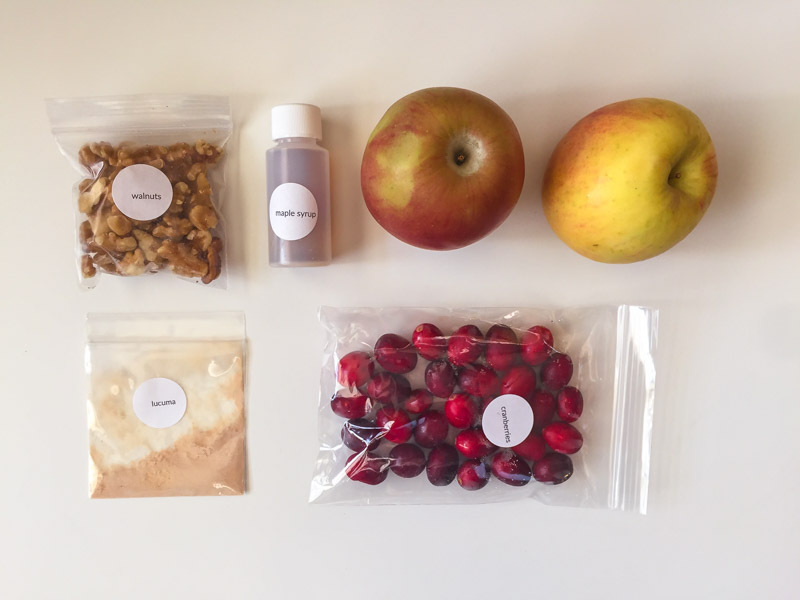 The company notes that each smoothie provides 2 servings, which is technically true. 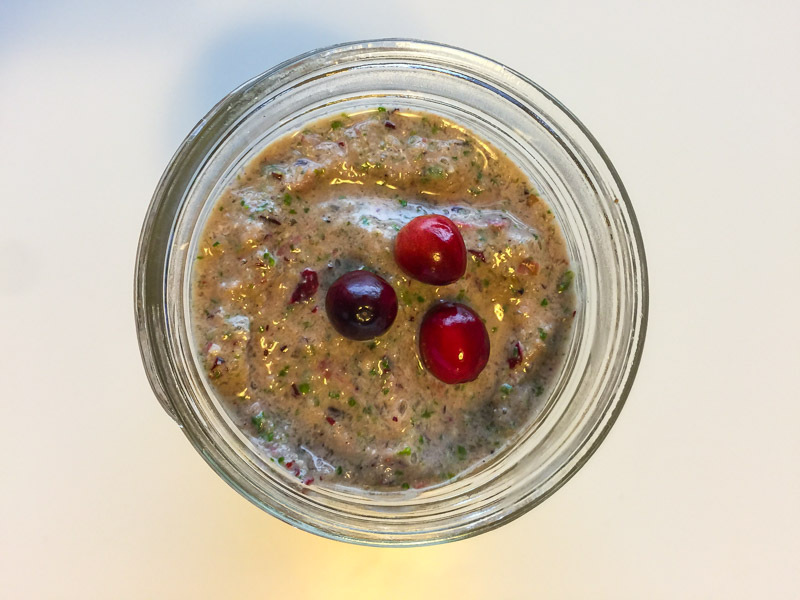 Though most folks, including me, wouldn’t be satisfied with just a 12-ounce smoothie for breakfast especially since many of them are very low calorie. More on that later. As you can see, Green Blender provides extra wide straws for sipping. Inside in the Booster Bag were tiny little plastic baggies of hemp seed, cashews, and pea protein powder. 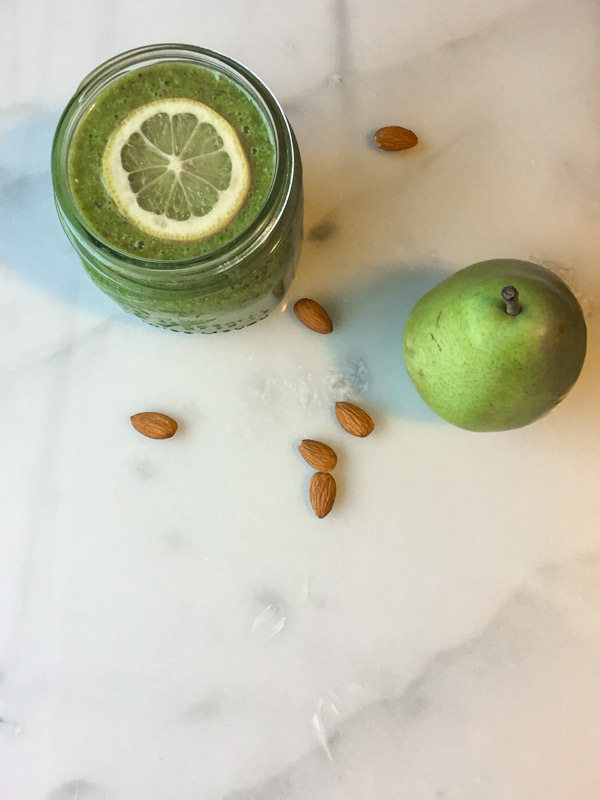 Each week has a theme, which for my time frame in December were Calming Smoothie Recipes and Vitamin C Infused Smoothies. 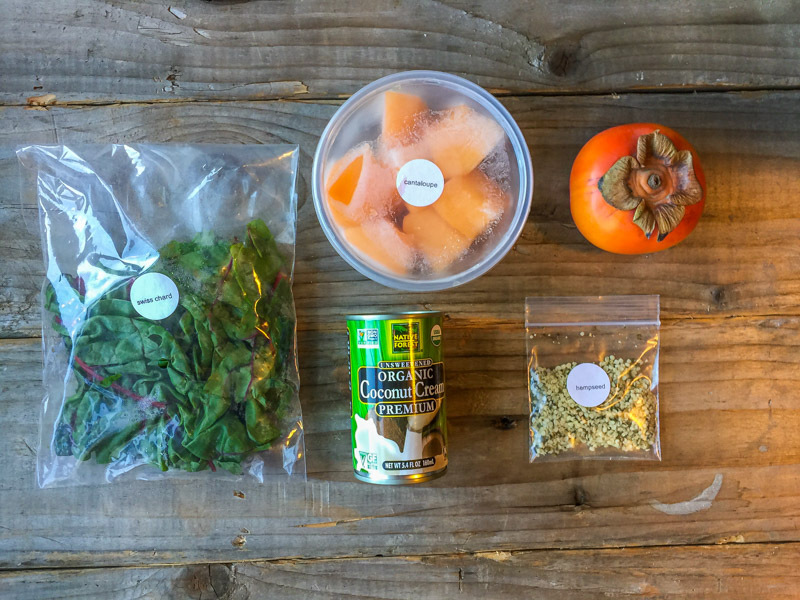 Along with your box of ingredients, you get 1 colorful recipe card with all 5 of the week’s smoothies. You have the option of making them with really any liquid, though their recipes recommend 1 cup water and 1 cup ice). I used non-dairy milk for a few just to experiment and boost the calories and mouthfeel somewhat. Unlike with Daily Harvest, you don’t get to choose your smoothies, you just get what’s coming that week, so it may be hit and miss with your favorite flavors. It definitely was for me. Like a committed food scientist though, I sampled and slurped 10 smoothies, and tried to note every itsy bitsy significant detail, which allows me to rank them for you below from worst to best. The worst of the bunch. It was really kind of horrible, and I didn’t even finish it. However, in all fairness, I did have to make a recipe substitution on this one. A key ingredient, the kumquats molded before I could use them (day 4 after delivery). I made a valiant effort to buy some replacements to give the smoothie a fair shake but the bite-sized citrus fruits are out of season so I used two peeled baby oranges instead. Totally boring. I’m sorry to say that but I expected bold flavor from cranberries and acai, and instead I got a mason jar full of icy blandness. Even using half water and half soymilk couldn’t perk this one up. The one can of coconut cream was spread between 3 recipes so each used just 2 tablespoons. I must have read this description too fast because I was somehow confused to find no honey in my box of ingredients. Alas, they sort of abbreviated as the honey comes from the (frozen) honeydew melon. 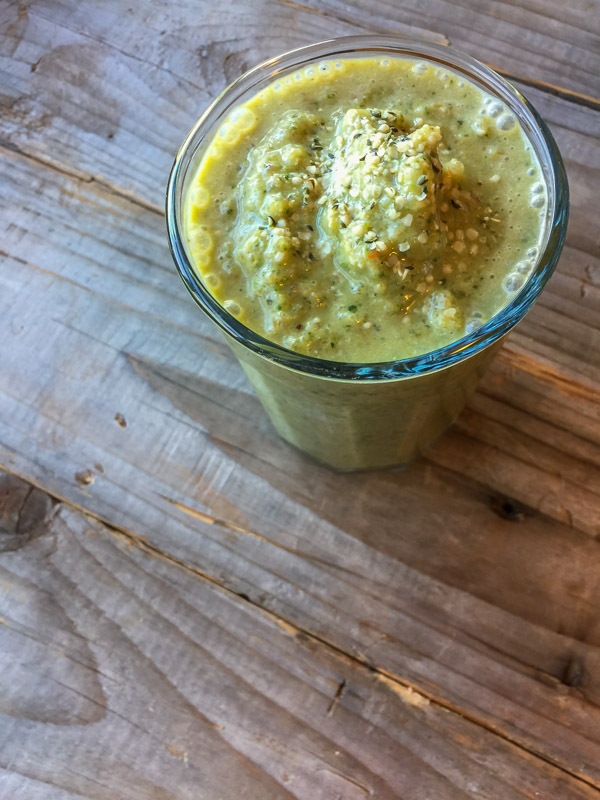 Lime predominates in this gloriously colored smoothie. Simple, but refreshing. Just to be safe, I peeled and steamed the beets for this pink powerhouse. I also peeled the ginger and froze the pineapple. What a great idea to rely on beets for the sweetness, paired with the tart pineapple and oranges. Colorful and modestly tasty. A great smoothie, and a little nostalgic for me. My mother-in-law makes a family favorite salad every Thanksgiving with sliced cranberries, walnuts, crushed pineapple, and whipped cream. 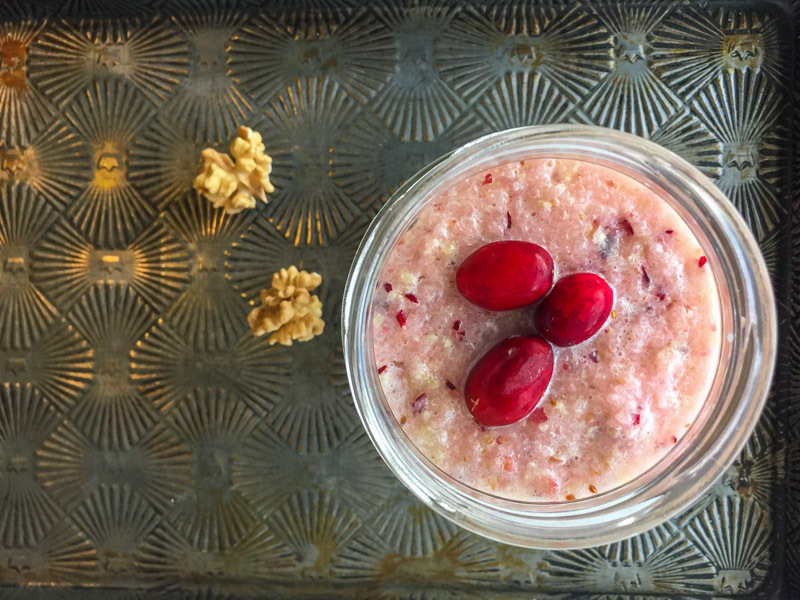 Somehow the color of this Maple Cranberry Tart smoothie reminded me of the wonderfully pale pink salad. It was even a little chunky like the salad with frozen cranberry pieces and walnuts. I think perhaps making it with soymilk would have rounded out the flavors better by bringing a little creaminess to the base. What was different from my beloved salad was the crisp taste from apples and the addition of lucuma powder. Lucuma is a fruit grown in Peru, in this case dried and powdered, that offers some sweetness and additional nutrient density to the mix. A dazzling color and a fresh, citrusy flavor made for a cheery morning breakfast. 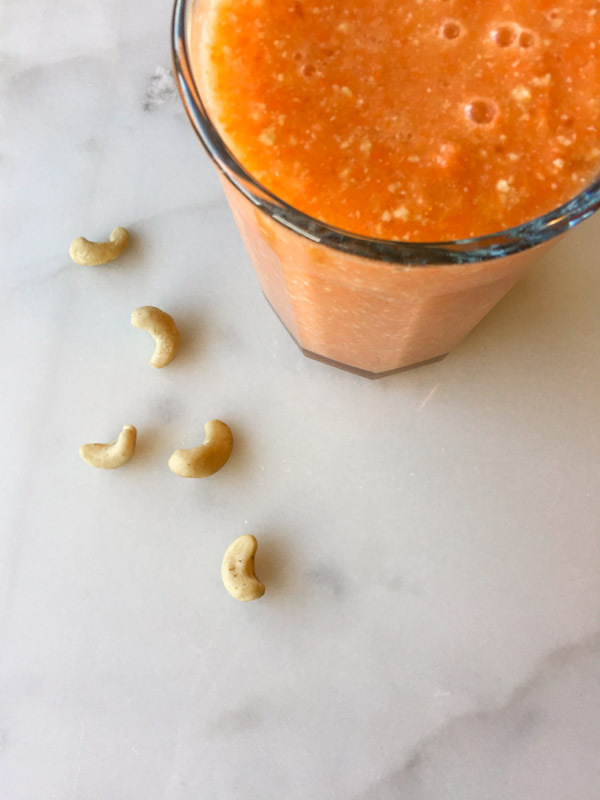 This smoothie came out of the blender a little chunky from the nuts and raw carrot, but that didn’t detract from the agreeability with my tongue. It was sweet, likely mostly from the (frozen) pineapple. Overall I was satisfied, just a little disappointed that no real pomegranate was present, especially considering the name, just a powdery substitute. My first impression was a good one. This smoothie had a pleasing color and the flavor was very fresh and very fruity. I couldn’t taste the coconut at all, as the coconut cream imparts barely even a mild influence. It was sweet enough, but needed some acid like lemon juice to brighten things up. I was confused about produce prep on this one as I was for a couple other recipes as well. I froze the cantaloupe and peeled the persimmon. And they get points for nutrition on this one; I don’t normally have Swiss chard at breakfast. Yay! Somebody brought a lemon to the party! Yum yummity yum. I froze the grapes and peeled the pear and this simple mixture of just 5 ingredients wasn’t just tart, but complex and well-rounded. I ended up making this one without ice because I used my hand blender/immersion blender and I wasn’t sure it could hack it. Not surprisingly, because I left out 1 cup of ice, the final smoothie yielded just 2 cups instead of the standard 3. Don’t be turned off by the color. This smoothie was awesome. Sweet, cinnamony, and the rice milk really made a difference in the flavor. Horchata is one of my very favorite things to drink of all time, so I had high expectations for this one, and it delivered. This was the first smoothie I sampled, and boy did we start off on the right foot. It was my favorite of the full two week subscription. 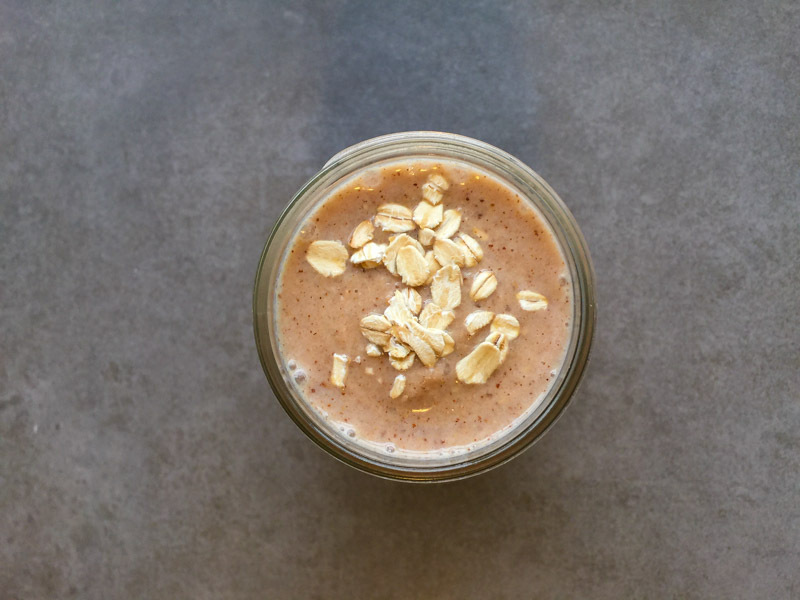 The cinnamon and almond butter flavors predominated, which is a wonderful combination. I modified the recipe a bit by using 1/2 cup ice, 1/2 cup water, and 1/2 cup soymilk. The creaminess was quite pleasing and surprising to me, and I really can’t believe it has an entire yellow squash in it. 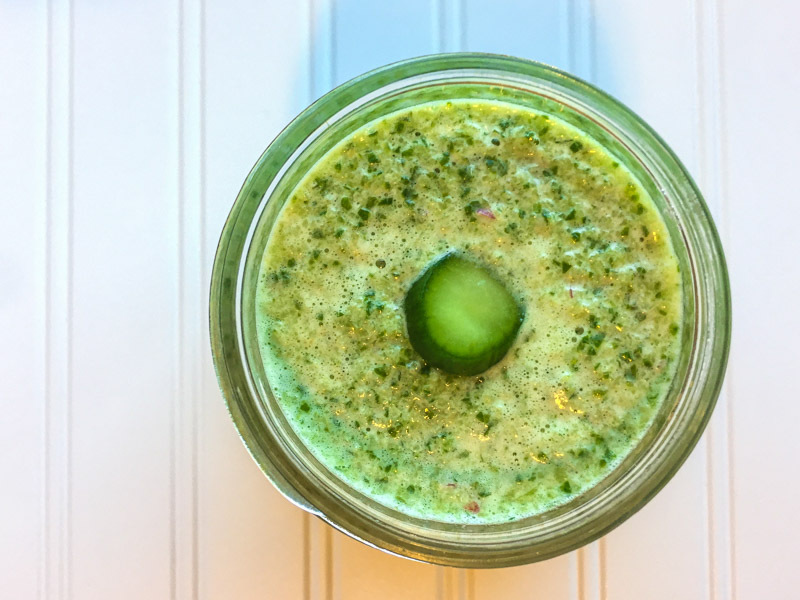 This recipe had the longest list of ingredients (7) and the most calories at 233 per serving, which may contribute to it making #1 on my list. I took a lot of notes during this crazy 2 week smoothie extravaganza, so I feel like I could go on and on with my detailed data analysis. Instead, I’ll do us both a favor and summarize my findings with a list of pros and cons. Green Blender provides giant straws. From a waste generating perspective, sending me 6 disposable straws isn’t ideal. But from a convenient sipping perspective, I sure liked having them. The smoothies come together fast. 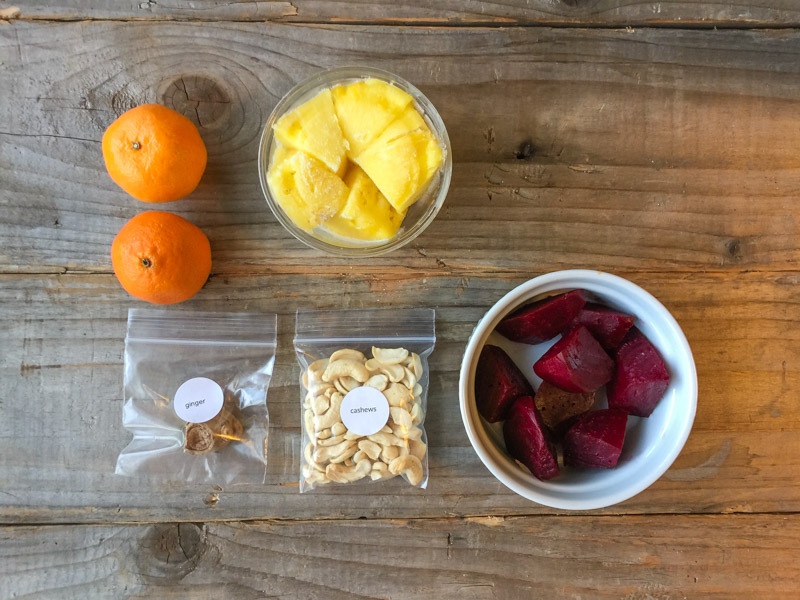 With only 5 to 7 ingredients per recipe, and minimal prep work, your smoothie is ready in just a few minutes. I appreciated how they tried to provide a concentrated source of protein for most of the recipes, relying on protein powder only twice. Whole foods are preferred over supplements or powders, so I liked seeing cashews, almond butter, walnuts, and hemp seed on the menu. Protein ranged from 3 to 6 grams per 12-ounce serving. The recipes are mostly all low in calories, with anywhere from 100 to 230 calories per serving. Even if you drank both servings, or all 24 ounces, you’d still be coming in around 200-460 calories which is pretty reasonable for breakfast. The lack of directions left me confused. I wasn’t sure what should be frozen or peeled. Even after reading the storage guidelines on their website, I still wasn’t sure what to refrigerate or leave out at room temperature. 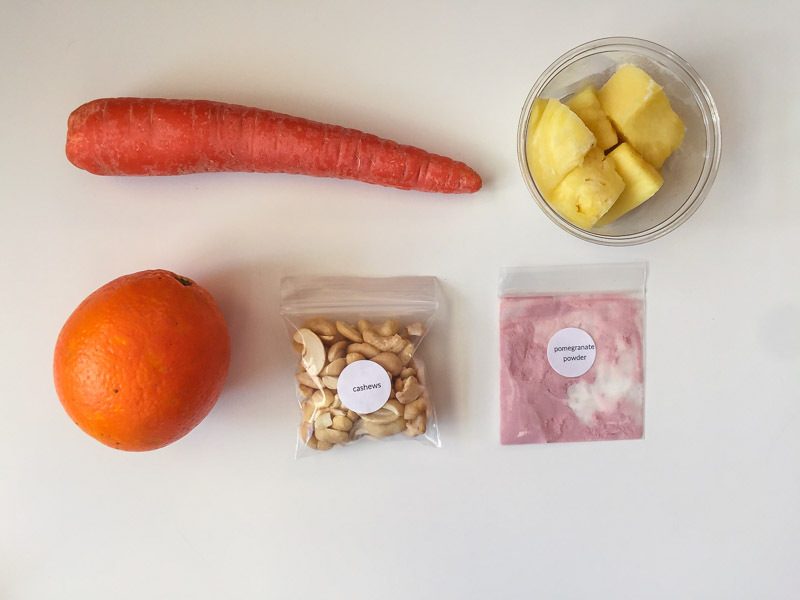 Instead of recipe instructions with each listing of ingredients, they provide a summary of nutrition benefits for each recipe. 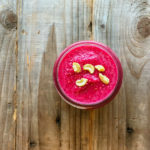 This is lovely, and I know smoothie preparation is fairly straightforward, but as a new customer using unfamiliar recipes, I would’ve appreciated someone holding my hand and guiding me just a little bit. I also wasn’t completely sure which smoothie to make first with regard to produce shelf life. I wonder if they’ve considered providing a recommended order so those with the most delicate ingredients get blended earlier in the week. 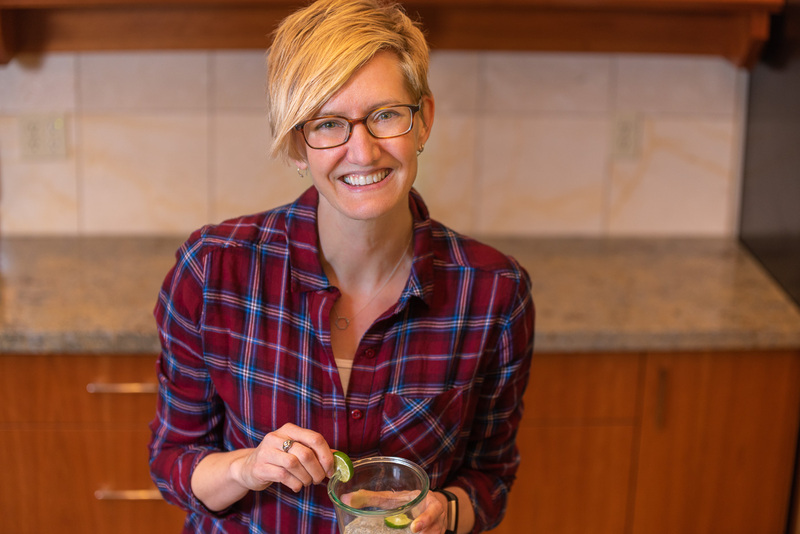 The recipes are geared to make 24 ounces, or two 12-ounce servings. I often didn’t put in the full cup of ice they called for, hoping to avoid diluting the flavor since I’d already put in a cup of water. When I have a smoothie for breakfast it’s usually all I have, so in some cases I drank both servings. I think it’s a little misleading to think someone is going to drink 130 calories of smoothie and be satisfied, unless it’s more for an afternoon snack or after-workout treat than a meal. I didn’t get too excited about the health claims associated with the week’s themes. 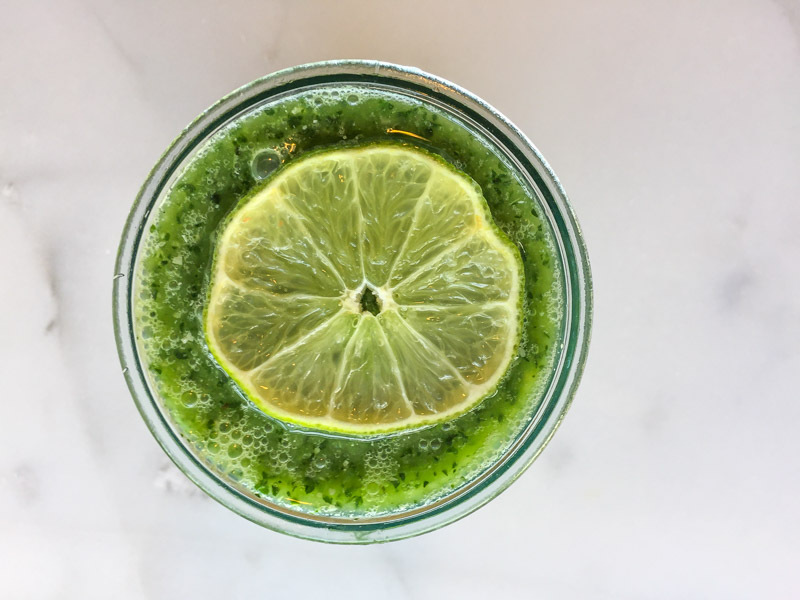 I don’t know of much research that would support the idea that a smoothie made with specific ingredients could calm me down, though I can be a cheerleader for the mountain of vegetables and fruit you consume in each glass (and the likely hefty dose of vitamin C). The nutrition facts weren’t consistently presented. Some included carbohydrate and some didn’t, and I’m a bit skeptical about a couple of the calorie counts that seem impossibly low. But for the most part, I think their numbers are in the ballpark. My conclusion is the same for Green Blender as it is for most of the similar services: it’s fun to try, it’s a good source of new ideas/recipes, I didn’t like every item, and I won’t continue long-term because of cost. But what a fun experiment to blend and sample 10 times over. Nothing like a little repetition, eh? What do you think? 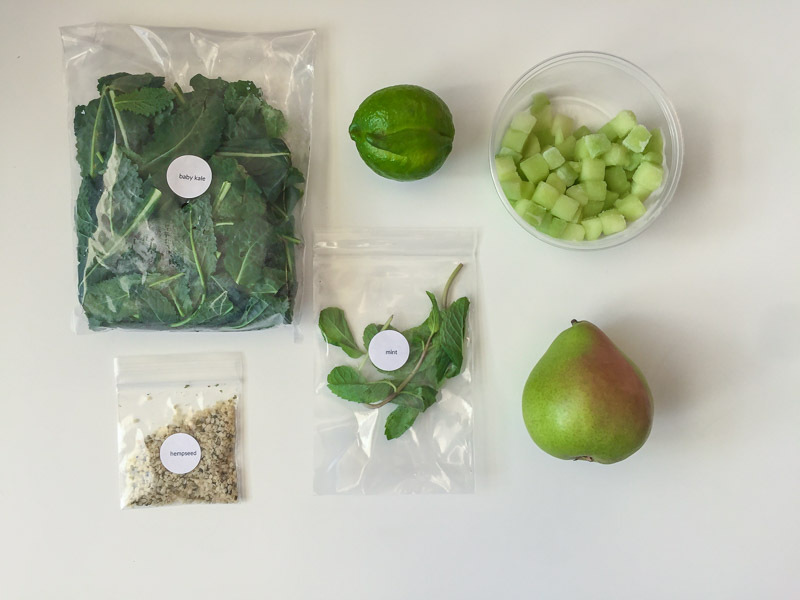 Would you become a smoothie convert if someone sent the recipes and ingredients right to your fridge? As with my other reviews of delivery kit services, I paid for Green Blender on my own and received no free product from the company. I hopped across this review in researching reasons to/ not to try this greenblender subscription. Your review is very detailed and the best of all I have read. Thanks, Antoinette. I’m glad you found it helpful! How did I not know about them? I will try it just to give my morning routine a pick me up. Thanks for your detailed review! Thanks for the helpful review. Convinced me to keep making my own smoothies and not try a delivery service. 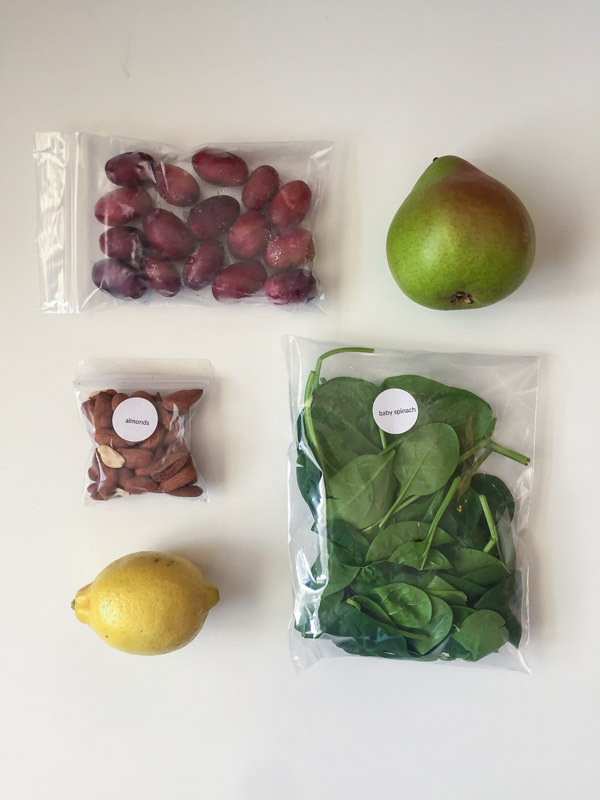 I came across your post after receiving my first Green Blender order from Fresh Direct. Three of my items arrived rotten (strawberries, cantaloupe and bananas) and I was so disappointed. Also, at almost $9 a smoothie, I’m not really saving any money over buying one from my local smoothie shop. I loved hearing your thoughts though (your pros and cons were spot on). Thanks for sharing! Thank you for your review. I was skeptacle because they didn’t offer you choices like daily harvest. I will keep making my own smoothies!! For the price, I should only have to dump it in the blender! 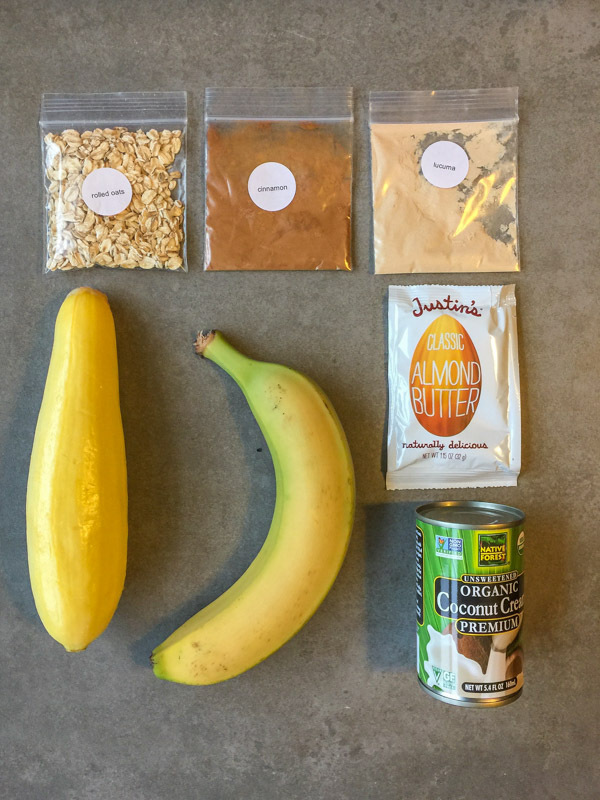 I can understand the banana being whole but peeling, cutting up and haveing to juice all of the other ingredients is to much. I even had to take the steams off of the grapes! NOT for $49 per week I shouldn’t! I appreciate the time you took to try Green Blender. You were fair and thorough. I just got my kit yesterday afternoonand was quite surprised when I opend the box. The produce quality was a disappointment. The Purely Elisabeth probiotic got sampled right away. It was truly delicious and was my consolation for buying the Green Blender box. The granola was so delicious I figured my first smoothie would be as delicious. Wrong! I have a Blendtec and it was straining my motor. I kept stirring it and tasting it. I was underwhelmed. I had to put coconut water in to get my blender to blend. It came with a very green banana. Which was difficult to peel and worse to eat. 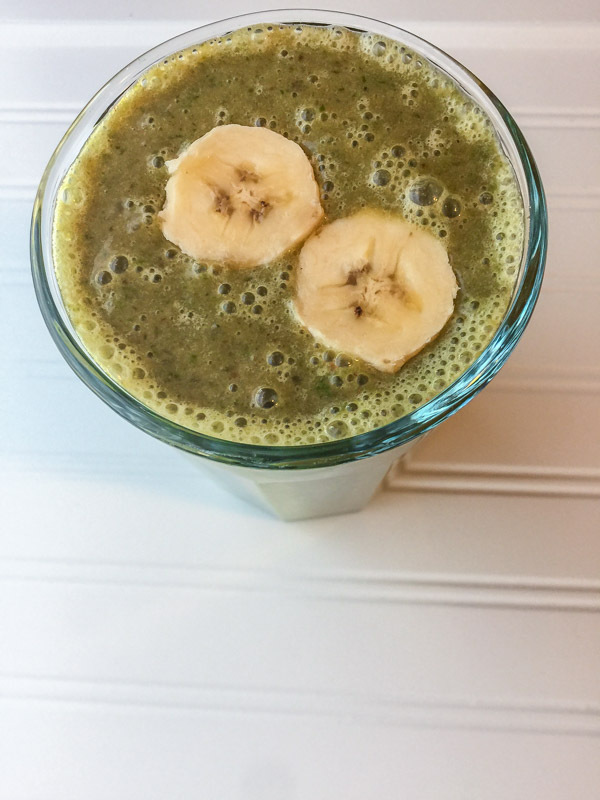 By the time I got it blended and floated the green banana on top and added the 1/3 cup granola on top of the slop mixture….my daughter and I decided to throw our bowls of the smoothie into the blender to try to salvage it. That was my day one. I have higher hopes for the next four days as I don’t think any of them can be worse then this. But my biggest complaint is the false advertising they do. They show a picture of a whole bunch of perfectly yellow bananas next to the box and a full sized bunch of scrumptious looking grapes, so when I got one green banana wrapped in white foam sheet and a tinsy apple with brown mark, and the smallest handful of not scrumptious looking grapes, I was very dissapointed. I was expecting Harry and David quality and a quantity more of what they show in the ad. I’ve gotten similar apples in the reduced section of the grocery store. So basically 10 to 12 fruits for $49. As that’s the biggest bulk of the smoothie, discounting a small handful of kale or a T of hemp seed or tsp. Of cinnamon. I know they need to make a profit, but at least give excellent produce. 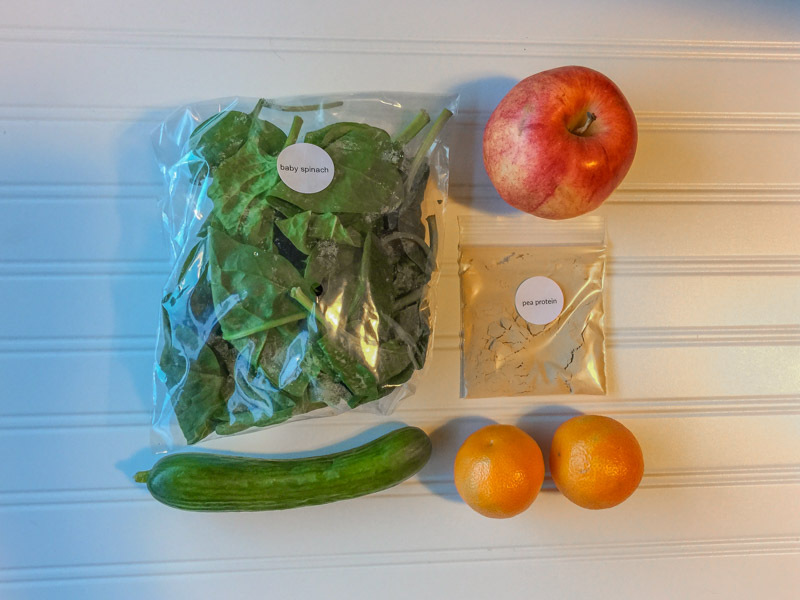 I was impressed with the variety of ingredients, so I need to reserve judgement on the remaining smoothies…however at almost $200 a month, I think I can do better choosing my own produce. I plan to cancel. Thank you for this wonderfully, detailed, and informative review! I was wondering about this compared to Daily Harvest…both of which I think are expensive…although I know most people will pay extra for convenience. I personally enjoy drinking a smoothie daily for breakfast after my workout but since it is my breakfast I make sure it has enough calories. 130 or even 200 calories is a snack not a meal IMO. I would be starving with only that amount.